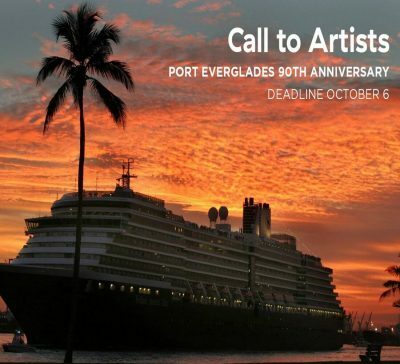 Call to Artists - Help Port Everglades celebrate their 90th anniversary! In partnership with the Port, Broward Cultural Division’s Public Art & Design Program is seeking to commission an artist or artist team to transform the exterior walls of a structure located on top of a 6-story parking garage which houses the Harbormaster Tower and Operations Center. Budget is no more than $90,000 and the application deadline is October 6.